“The heart has its reasons which reason knows not.” ― Blaise Pascal. You love her; you know she’s probably the right girl for you. But she’s different. 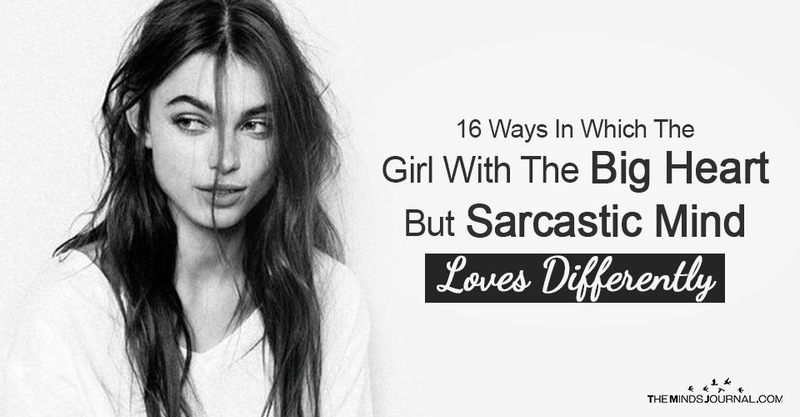 A girl with a big heart and sarcastic mind might often seem to be quite complicated but it’s not that difficult as it seems. She doesn’t mean to hurt anyone with her raw sense of humor. People love her for her wits and sarcasm. She might be herself when it comes to being physical interactions, but she finds it hard to reveal her emotions. Give her time. The strong, rough exterior she carries doesn’t define her. She’s actually very soft and weak. Price tags have no value for her. She appreciates presents which add meaning to the relationship, like a hand-made card or a home-made dinner. She hates to be diplomatic. While everyone else in the group pretend, she is honest about what she feels and she doesn’t care who likes it or not. Just because she has a big heart, that doesn’t mean she will let others hurt her. If that happens, she will withdraw and move out silently. If she’s indifferent, don’t worry. She is probably going through a problem of her own she doesn’t wish to share or she is facing difficulty in expressing some emotion. Give her time and she will come around. The word ‘half’ doesn’t exist in her dictionary. She gives her best in whatever she does. So, if she loves you, she will love you completely. If she doesn’t, then there’s no question of expecting anything from her. She will listen you with patience for hours without missing a single detail. Be it surprising her with flowers or making her a coffee when she’s working hard, these little gestures of love are always precious to her.